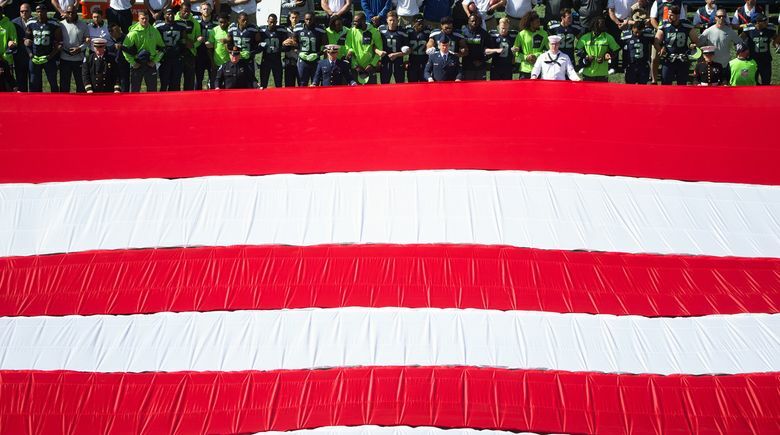 When a giant American flag covered nearly every inch of the turf at CenturyLink Field, the Seahawks stood and locked arms along the sideline. Terry Brown needed a minute to collect himself and hold back the tears. He took his 8-year-old son Colby to the Seahawks opener on a sun-kissed Sunday afternoon knowing team members had planned to make a statement during the national anthem on the 15th anniversary of the 2001 attacks in New York and Washington, D.C.
That day carries painful memories for Brown, an Army veteran and 14-year firefighter for South Pierce Fire and Rescue in Eatonville and Roy. 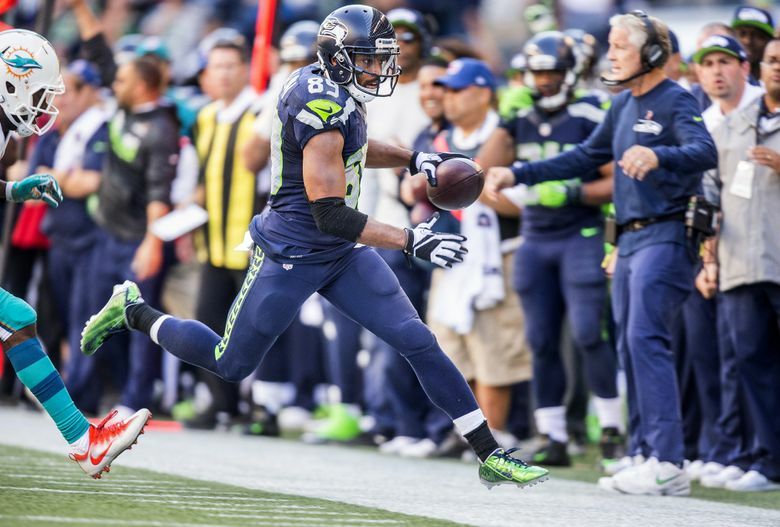 The Seahawks have won every home opener in the Pete Carroll era, a stretch of seven seasons, and have won eight consecutive home openers overall. “A lot of brave men and women sacrificed on this day for no good reason other than a bunch of people who were jealous of our freedom,” said Brown, whose voice cracked with emotion as he dampened his moist eyes with his hand. “They were jealous of what the men and women who wear a uniform in the country fought and provided for us. Across the field, four members of the Miami Dolphins — running back Arian Foster, linebacker Jelani Jenkins, receiver Kenny Stills and safety Michael Thomas — took a knee when the national anthem played, a common occurrence recently at sporting events since the 49ers’ Colin Kaepernick refused to stand for the anthem before an exhibition game to draw attention to racial inequality, social injustice and police brutality. After the Seahawks’ 12-10 victory Sunday, the Dolphins pushed back on criticism about their protest and the timing, on the 15th anniversary of the 9/11 terror attacks. “We had a commemorative speech from President Obama about 40 seconds long before the national anthem was played that we all stood for,” Foster said. “So we honored those that lost their lives 15 years ago on that event. This wasn’t about 9/11. Dolphins coach Adam Gase knew the players were planning a demonstration and urged them to be respectful. Elsewhere Sunday, former Washington Husky Marcus Peters, now with the Chiefs, stood for the anthem before Kansas City’s game against the Chargers while raising his right fist. Since Kaepernick’s initial protest several athletes also have refused to stand during the anthem, including Seattle cornerback Jeremy Lane during an exhibition game. The NFL Network’s Ian Rappaport reported the Seahawks had planned to kneel together with their hands over their hearts Sunday, but some players didn’t feel comfortable with that. 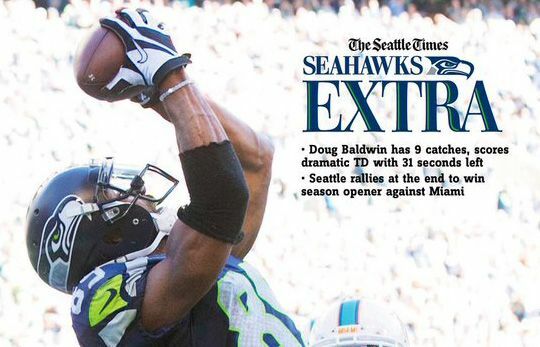 Still, some Seahawks fans didn’t know what to expect when they arrived at the stadium Sunday. LT Jones, a 55-year-old retiree who lives in Auburn and has been a Seahawks season-ticket holder with her husband Michael for the past 14 years, said politics and sports do not mix. “I understand all of the politics going on, but let’s play football and leave that someplace else,” she said. “There’s too much crap going on in America right now. This is my release to come to a football game. I want to see football. Warren Moon, a former Husky and Seahawk and the first African-American Hall of Fame quarterback, said the Seahawks struck the perfect balance Sunday. Moon, 59, said there’s been tremendous growth in discussions about race equality, social activism and sports since 1984 when he first entered the NFL. The Seahawks said they plan to continue locking arms during the anthem for the rest of the season. “We had a lot of guys that were socially active like Jim Brown, Kareem Abdul-Jabbar and Muhammad Ali,” Moon said. “They did it way back when it wasn’t that popular to do and survived it.